Tracy Aviary in Salt Lake City, Utah had a problem. Its reputation as a place for families was great, but it was not a hot spot for teens. 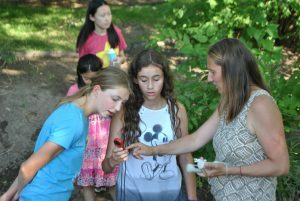 On top of that, the kids who went through all of our summer camps, those die-hard bird nerds for whom Tracy Aviary was a special place, were aging out and had no more Aviary programs made for them! In October of 2017, while I was puzzling over this problem, I visited my parents in Texas and made a trip to one of my favorite institutions: the Texas State Aquarium. I learned from an educator there that the Aquarium was doing a teen STEM café called Making Waves. How cool! This was my first time hearing about such a program, and the format sounded like a great fit for Tracy Aviary. After reviewing the Teen Science Café Network’s online resources, I pitched the model to my supervisor. I suggested summer as a trial run. Maybe those teens aging out of our camps would be interested. If it flopped, we could go back to the drawing board. My supervisor approved! I launched into preparations, and Taking Flight Nights were born. Our first Teen Advisory Board meeting happened in March, and our eight teen leaders voiced so many exciting ideas. They immediately changed our program to STEAM cafés; they wanted to incorporate the Arts. I let them determine the event schedule. This enthusiastic bunch wanted to go all out. They planned five cafés for the summer—two in June and July and one in August. The Teen Advisory Board even took on reaching out to potential presenters. Teen leaders coordinated three out of five of the first cafés entirely on their own, and presenters gave very positive feedback about the experience! Okay, so our teen leaders were amazing, but would participants show up? The teen leaders had tried to get the word out before school ended, put up flyers around town, and worked on our Instagram following, but without an in-school reminder the week of, would it be enough? YES! While we didn’t have a stampede through the gate, fourteen people ended up being perfect for the space (the second floor of our on-site café). 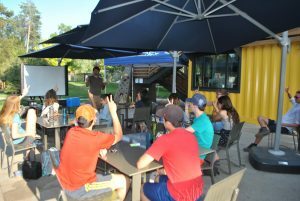 As the program gained traction, we later moved to our larger patio area. An added bonus of summer cafés, depending on your location and facility, is that it’s warm enough to enjoy outdoor spaces. (Okay, as a South Texas native, I know that summer can be TOO warm for that, but for a lot of the country, summer evenings are great!) So, as it turns out, you can still rally an audience of teens in the summer. Providing a full meal and making that known helps! I understand the hesitation to try this. Our teen leaders did have vacations and internships that sometimes conflicted. However, we had set our event dates only after we checked everyone’s availability. This ensured there were always at least a few teen leaders who could make it to the cafés to set up, introduce our presenter, mingle with participants, and clean up after. Our summer cafés went so smoothly, we eagerly took on hosting cafés year-round. 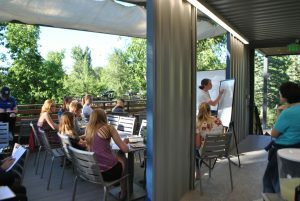 Plan summer dates with teen leader availability in mind. Promote summer cafés before school is out. Put up flyers where teens hang out outside of school. Provide a meal and let everyone know about it! So give it a try! Hey, while participants are enjoying the food and fun, you’ll be secretly fighting that notorious summer brain drain. With adequate planning, summer cafés are incredibly rewarding!